Groundwater comprises one of the most important objects of subsurface. They are of strategic importance as a reliable and quality source of drinking water supply. In addition, groundwater is the source of curative, heating and hydromineral raw materials. Groundwater is considered to be the national-rank commodity. It has a dual nature: on the one hand, it is moving raw material that circulates in rocks and its use requires extraction from subsurface, and on the other hand it is a part of the total water resources of the planet, which interacts with surface waters, atmosphere and other components of natural environment. In this regard, groundwater resources and their exploitation reserves do depend not only on geological and hydrogeological but also on the physical and geographical conditions and anthropogenic factors that modify the rate of groundwater supply, its quality and the possibility of production and use. Distribution of groundwater over territory of Ukraine is caused by geological structure and history of the natural development of its various parts. These are separate and distinct from each other hydrogeological regions, different in age, composition and geological setting of the host rocks. They are distinguished by the major natural factors that determine the patterns of groundwater formation, distribution, composition and exploitation conditions. Dnieper-Donetsk artesian basin is located in the northeast part of Ukraine in Dniprovsko-Donetska Depression and covers Chernigiv, Sumy, Poltava, Kharkiv (without southeastern portion) and the northern part of Kyiv, Cherkasy and Lugansk regions. It is a classic type artesian basins, which display consistently spread aquifers and low-permeable rocks over large areas, which determines relatively shallow depth of aquifers. The sedimentary pile is saturated with groundwater and comprises the common system of aquifer interconnected between each other and surface water in various extent through low-permeable rock layers. Over most part of the territory the favorable conditions for prognostic resources and groundwater feeding do occur. Extensive water exchange zone ranges from 300 to 700 m.
Volyn-Podillya artesian basin is located in western Ukraine in Volyno-Podilska plate, and covers Volyn, Rivne, Ternopil, western half of Khmelnytsky, north-eastern parts of Lviv, Ivano-Frankivsk and Chernivtsi regions, and a small part of Vinnytsia region. In hydrogeological respect, the basin is characterized by favorable conditions for prognostic groundwater resources development and occurrence of enriched freshwater aquifers, which constitute a thick zone (up to 1 km and more in north and east). There is a distinct well-developed system of aquifers, which are actually not separated by a thick water-proofs and do form a single aquifer system. The zone of extensive water exchange in the region is limited by the depth of fractured rocks, from 100-110 m in the western and central parts of the basin to 300-350 m in the northern part. Fore Black Sea artesian basin is located in the south of Ukraine and covers the territory of Odesa, Mykolaiv, Kherson, western half of Zaporizhzhya region and part of Plain Crimea. Most of the basin is confined to Fore Black Sea Depression, and steppe part of Crimean Peninsula, which is located north of Mountain Crimea, the Scythian Platform.Hydrogeological conditions in the region are complex because of diverse and discontinuous aquifers and low-permeable rocks, facial variability of the host rock lithological composition, diversity of groundwater quality. The region belongs to the zone of insufficient moisture and groundwater supply. 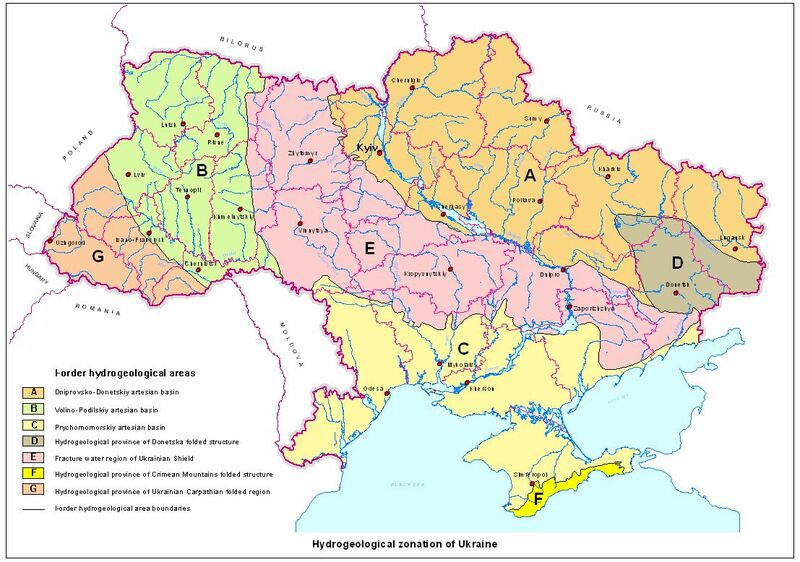 The zone of active water exchange increases from north to south from 50 to 300 m.
Hydrogeological province of Donetsk folded region is located in the south-eastern part of Ukraine and confined to the central area of ​​Donetsk folded structure (Donbas). 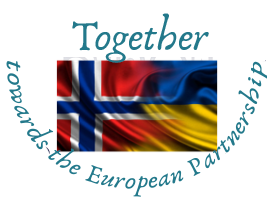 It covers most of the Donetsk, southern part of Lugansk and south-eastern part of Kharkiv regions. The junction zone of Donbass and Dniprovsko-Donetska Depression has complicated hydrogeological conditions of groundwater formation (horizontal and vertical aquifers inconsistency). The region is characterized by the dry climate and extensive exploitation of groundwater, as well as significant influence of mine drainage, which increases overflows between aquifers and activates groundwater drainage. The zone of active water exchange in different parts of the region varies from 100 m to 300 m and more. The region of fracture waters of Ukrainian Shield is located in the central part of Ukraine within the large uplift of ancient crystalline basement and covers the territory of Zhitomir, Kiev, Kirovograd, eastern part of Khmelnitsky, south parts of Kiev and Dnipropetrovsk, south-western part of Cherkasy, northern outskirts of Odessa and Mykolaiv, as well as the north-eastern part of Zaporozhzhya regions. Hydrogeological conditions of groundwater accumulation and circulation in the basin are unfavorable for the formation of significant amounts of water resources, while horizontal and vertical water saturation of the rocks is extremely uneven. Groundwater is contained both in the area of ​​fractured Precambrian crystalline rocks and in the sediments that fill depressions in the crystalline basement. The zone of active water exchange is 100-150 m. Fractured rocks are developed everywhere, but their fracturing extent is variable, that causes uneven watering. The water-bearing of sediments, which are mainly developed at watershed areas, is local. These rocks occur at shallow depths, which often cause groundwater quality deterioration. Hydrogeological province of the folded Mountain Crimea is located in the southern part of the Crimean Peninsula and confined to mega-anticlinorium of Mountain Crimea encompassing the mountain part of Crimea. Hydrogeological conditions of the region are complex due to the folded nature of geological column and broad development of karst zones that make active draining the upper rock sequence and reinforce the underground drain. Essential draining, low fracturing and small distribution areas of ​​water-bearing rocks coupled with the few rainfall and significant evaporation, do not contribute to the accumulation of significant groundwater resources. Hydrogeological province of the folded Ukrainian Carpathians is located in southwestern Ukraine in the young folded structure of Carpathians, Transcarpathian trough and Fore-Carpathian trough, and covers Transcarpathian region, central and southern parts of Lviv, Ivano-Frankivsk and Chernivtsi regions. The province is characterized by complex hydrogeological conditions caused by the large variety of geomorphological, geological and tectonic features. The aquifers are irregularly distributed, complex in their relationships, and unevenly saturated with water in lateral direction. The presence of salt and clay formations in the Carpathian trough, the relief dismembering, tectonic breaking and low filtration and capacitive properties of the rocks do not contribute to the accumulation of significant amount of groundwater in this province, despite of the fact that the region as a whole is the most humid in Ukraine.